Their land gone and facing displacement, tribals in some villages are busy salvaging ready crops after water was released from the dam to beautify the backdrop of the Rs 3,000 crore 'Statue of Unity' for VIP eyes. 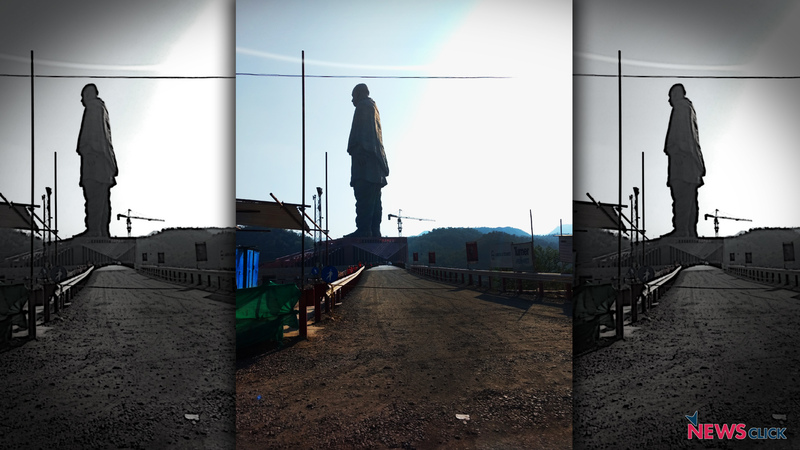 About 500 metres from the nearly Rs 3,000 crore ‘Statue of Unity’ in Narmada district, stand five huts. One of them is the abode of Ambaben Poonabhai, a 60-year-old woman who was once sarpanch of Limdi group gram panchayat of Limdi and Navagam villages. “About 40 acres of land in Navagam will be submerged till October 31. Farmers had cultivated vegetables which are almost ready. Nobody told us that water is being released from the dam. We are witnessing the water level rise by the hour and land submerging gradually,” Ambaben told Newsclick. “Farmers are frantically working in the fields trying to salvage what they can,” adds Ambaben, who waits along with other tribal residents of Navagam as their land submerges gradually. “A family owns between 2-4 acres of land. There are poor tribal families who sustain themselves on crops and vegetables they grow on their small patch of land. Now that the land will be submerged, most of them will have no means of feeding themselves or their family,” says Sanjay Tadvi, son of Ambaben, and a resident of Navagam. The shop that was once by the road side was demolished to widen the road. The land was never formally acquired and demolished as it fell in the way. The owner rebuilt the shop and now fears that shop will submerge any-day when water rises in the weir that flows down as water is being released for inauguration. New posters were put up with picture of Birsa Munda in center and picture of Modi in the corner. Handwritten notice of bandh on October 31st all across Rajpipla market. The new road being built for inauguration and then for tourists is part of the project. Three villages have lost their land completely for widening of this road on the hill. This one hut stands, about 500 metres from the statue, while others around it have been demolished. This spot used to be a village once. “We have already lost a major portion of our land when the road to Sardar Sarovar dam was being built. The Gujarat government promised us 5 acres per family and jobs for whoever is above 18 years of age. But neither were we allotted any piece of land nor did we get any job. We have submitted memorandums and letters to the district authorities to the office of Chief Minister in Gandhinagar, but in vain. After a long silence, they told us, the project missed counting us in the victim list, and assured that our names shall be included when the weir is built. Instead of being rehabilitated, we lost our portion of the remaining land acquired for widening the road to the ‘Statue of Unity’, and remaining shall drown as the water level rises in the weir,” adds Sanjay, who works as a labourer in Kevadiya Colony that fetches him Rs 200 a day. Six villages – Navagam, Waghariya, Limdi, Kevadiya, Kothi and Gora -- immediately around the Sadhu Bet, the location of the ‘Statue of Unity’ are badly affected. Of these, Waghariya has lost all of its land, while Kevadiya village has lost about 90% of land. Noticeably, villagers of Kevadiya were displaced just a week ago when the road to Sadhu Bet was being widened from two lanes to four lanes. Amidst strong protests, the police lathi-charged indiscriminately injuring even women and detained the villagers for 24 hours. When the villagers returned to the village after their release, every house along the road had been demolished. The residents of Kevadiya have now settled a kilometre away amid a rocky patch of land. Sarojben, who led the protest and a few others are under constant police watch and refused to speak on the issue. “By the evening of October 30, police personnel will be deployed in front of every household around the villages surrounding Sadhu Bet, barring locals from stepping out of their homes,” Lakhanbhai, an activist working with tribals of the area, told Newsclick. “This is how the locals are restricted from freely moving in their own land every time a VIP visits the area,” he adds. “The water pipeline and several handpumps in the area have been demolished while widening the road. Six villages of the area have no means of drinking water. When we approached the district authorities, they turned a blind eye. Later Larsen and Toubro (L&T), the company that is working on the project, arranged for water to be delivered by tankers of its own accord. The tankers deliver water twice a day to those living by the side of the road. But villagers whose houses were demolished and have been pushed away from the road have no access to the tanker water. This has been the situation for a month now,” says Govind Bhai Tadvi, sarpanch of Waghariya village. “Besides the amount of water that each family is getting through tanker isn’t enough,” he adds. All the residents of Waghariya have been displaced due to the project of ‘Statue of Unity’. Out of an entire village that had an population of about 1,500, 15 displaced families have been rehabilitated in mud huts in an area with no amenities like electricity or drinking water. The rest of them are being pushed to accept land very far away from their homes. “Our family was offered a housing plot in Pansoli village near Dabhoi, about 60 kilometres from our house, and the land for cultivation was allotted at Tel Taalav, about 10 kilometres away from the housing plot. How can a farmer travel 10 kilometre to cultivate his field every day?” shares Govindbhai. “We refused to accept land at such a distance from our original home. Later, we were offered Rs 5 lakh, but we refused that too as the market value of the land my family owns is more than Rs 1 crore,” adds Govindbhai. “Six acres of land that our family still owns at the bank of the weir will be submerged in two days. I don’t think we can salvage all of the cotton we have cultivated,” he says, pointing towards several sacks of cotton stacked up in his house, the crop that he could salvage so far. The villagers resent being dumped to the fringes without being consulted even once. “The locals were never taken into confidence or told that such a huge scale of tourist place shall be built on and around their homes. The tribals of the area have been losing their land since the inception of the Sardar Sarovar dam. Now they have built such a massive statue, valley of flowers and Bharat Sreshth Bhawan (guest house of every state) is to come up along with it. Does the government ever think on whose land are they building the projects? The locals here solely depend on agriculture. If their land is snatched how will they survive. We will not leave our land,” says Lakhanbhai. A protest and bandh have been called in the district by Praful Vasava, a local tribal leader. About 100 tribal organisations of 15 tribal-dominated districts of Gujarat have supported the cause. The tribals have been tearing off the posters of the project featuring Prime Minister Narendra Modi and Gujarat Chief Minister Vijay Rupani. Massive police force has been deployed in Narmada district viewing the resistance from the tribals. Noticeably, police personnel have also been deployed to protect the posters. “About 85% of the population of Narmada district are tribals. The land in the district is protected under the Fifth Cchedule. As per law, if land is to be acquired, the gram sabha has to agree to give it away. But while building the Narmada weir dam or ‘Statue of Unity’, the Gujarat government did not bother to take permission of the gram sabha of respective villages. Land from 13 villages have been acquired for the weir dam. Tribals of these villages have neither received money or land elsewhere in lieu of their land lost to the dam,” Vasava said. 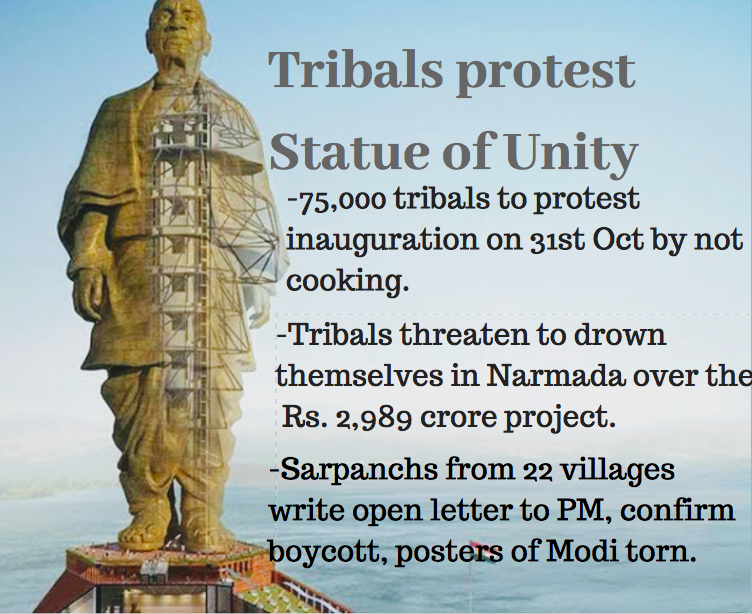 “In total 72 villages and 75,000 tribal villagers have been affected by the project of ‘Statue of Unity’. The government is destroying our homes, land and culture It is a fight of jal, jungle, zameen (water, forest and land),” adds Vasava, who apprehends he shall be detained by the evening of October 30.